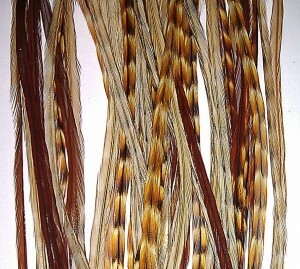 We have REAL feather hair extensions, like, Grizzly Rooster feathers, Rooster feathers , Peacock feathers ,feathers earrings ec... made from 100% feathers. These can be brushed, blow-dried, straightened and even curled! These are 100% REAL feather extensions. They are recommended to be installed using micro links and do NOT need heat or glue. They come in a variety of colors from lavender to turquoise to natural and even fall foliage. They can be brushed, blow-dried, straightened, and even curled. They will last anywhere from a few weeks to several months, depending on your care.